VTech InnoTab MAX Only $84.97 + FREE Shipping (Reg. $110)! You are here: Home / Great Deals / VTech InnoTab MAX Only $84.97 + FREE Shipping (Reg. $110)! WOW! 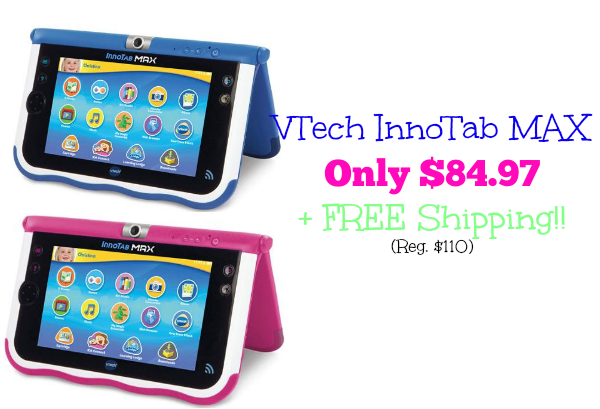 Hurry and grab one of these pink or blue VTech InnoTab MAX on ROLLBACK for only $84.97 + FREE Shipping (Reg. $110)! They have Christmas shipping options, however, select FREE in-store pickup so you wont’ have to worry! Click here to check out more Great Deals!